News and information about my web site devoted to the history and emblems of Kecoughtan Lodge. 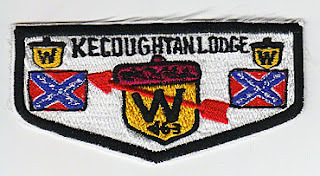 Recently I spotted on eBay a crude fake of a 463s5, the white background Kecoughtan 25th Anniversary flap with black border and lettering. The seller was located in Okinawa and advised me that it was purchased at Flight Patch Shop on Gate 2 Street and was the only one available. The differences in the fake and the real version are so extreme that it's virtually impossible to confuse them unless you know absolutely nothing about Kecoughtan issues. The fake has a cut edge and the embroidered design is ragged and uneven. Above is a picture of the Okinawa version from 2010 and below is a picture of the actual item from 1976. Copyright © 1999-2013 by . All Rights Reserved.